SGR-27: Sinners & Saints E.P. Formed in the dirty back alleys and dive bars of Toronto, Ontario in 2005, THE CREEPSHOW has redefined the saying "No Rest For The Wicked". Since their inception, the band has brought their genre-defying blend of country-tinged, psycho punk rock n' roll to over 25 countries worldwide with plans to conquer many more as soon as possible. Fronted by the vivacious Kenda (guitar/vox) and backed by the swarthy Sean "Sick Boy" McNab (stand-up bass/vox), The Reverend McGinty (sermons/organ/vox) and the righteous Sandro (skins), THE CREEPSHOW is an explosion of live energy that is a tasty treat for the ears and eyes alike... Whatever you do though, don't write THE CREEPSHOW off as just another psychobilly band. While their lyrics draw inspiration from b-movies and early horror films, they're also full of personal insight and personal stories dealing with everything from addiction to mental health to tales of love gone horribly wrong. THE CREEPSHOW's passion for touring is borderline obsessive-compulsive. They have an incredibly personal dedication to their fans and their live show that is nothing short of astounding. Watching their set is a full frontal assault on all your senses and you definitely have to stay on your toes when you're at one of their shows. You never know when they might rush into the crowd for a scream-along with fans or launch their band mates across the stage from the neck of the stand up bass. 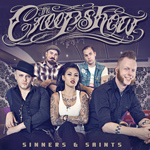 THE CREEPSHOW have shared the stage with countless awesome bands including Rancid, Tiger Army, The Buzzcocks, The Unseen, Agnostic Front, Mad Sin, Demented Are Go and have appeared on killer touring fests like Warped Tour, Ink n' Iron, Festival Of Fear, Mighty Sounds, Rebellion, Japan Punk Spring and Australia's Soundwave Fest. 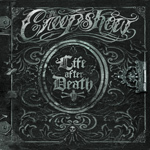 THE CREEPSHOW's debut album "Sell Your Soul" came out in 2006 and immediately caught the attention of fans and press worldwide. With the onslaught of media attention and demand from fans, the band dropped everything and embarked on an nonstop tour across the USA, Canada and Europe. At they very beginning of their European tour, they were hijacked by fake cops in Spain and robbed of nearly everything they had. While most sane bands would have hung their heads and called it a day, THE CREEPSHOW sucked it up and finished the remaining 5 weeks of the tour without batting a lash. That's just how they roll. In the summer of 2010, the Creepshow finally returned home to their native Toronto for the first time in a very long time. Inspired by their years of travel, hundreds of shows and slightly battered by the experience, the band entered the studio with only one thought on their collective mind...REVENGE! The resulting full-length "They All Fall Down" is by far the band's best and most terrifying to date. From the opening explosive chords on "Get What's Coming" to the deceptively seductive ballad "Sleep Tight" to the knock-down-drag-out punk rock title anthem, "They All Fall Down" is a full throttle hellride into the Creepshow's dark and wonderful world. Released wordwide in October 2010, the band once again took their eye-popping live show across the globe. Fast forward through almost 2 years of constant touring, debauchery and general mayhem to the present time. 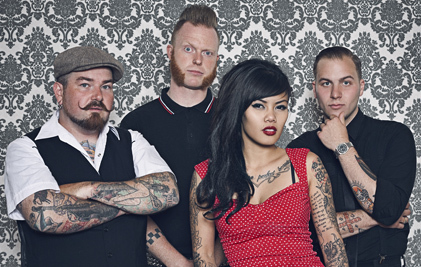 The Creepshow are back on their home turf and ready to rumble. A line-up change in 2012 added some killer new blood to the band in the form of Kenda (vox/guitar) and Sandro (drums). Both members have a brought a revitalized energy and intensity to the gang along with fresh new sources of songwriting talent. The Creepshow are currently quarantined deep in their laboratory working on their 4th full-length album slated for a late 2013 release. Insider sources have confirmed that the new material is fantastically wild, addictive and more powerful than a hurricane. Stay tuned for new music, videos and events in the coming months!